In this fertile state, plants are not dissimilar to minute flowers in bud. 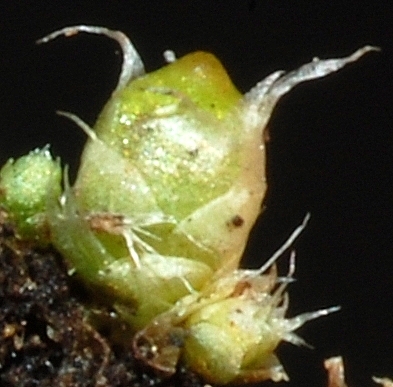 The capsule of Gigaspermum repens has a large operculum which falls off when the capsules are ripe, leaving a great gaping mouth and exposing the characteristically large spores (hence ‘Gigaspermum‘ which means large seeds) that are just visible to the naked eye. Mueller was a first rate botanical collector and his mis-description is no reflection of the lack of expertise on his part. Mueller was certainly aware of what mosses are. However, this episode does bear testimony to the morphological diversity that mosses can encompass, sans flowers. 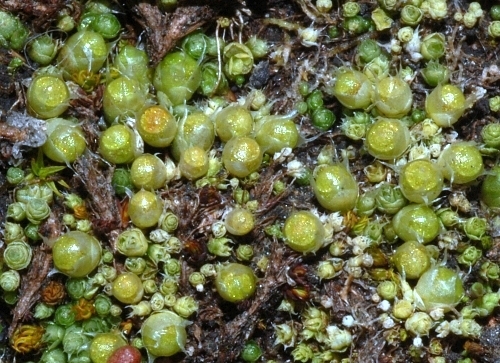 This entry was posted in Botanical History, Bryophytes, Plant Morphology and tagged Bryophytes, Ferdinand von Mueller, Gigaspermaceae, Gigaspermum repens, moss, Mt Nelson, Mueller, pyxidate, pyxidate capsule, Trianthema, Trianthema humillima. Bookmark the permalink.